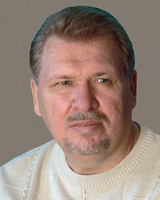 He was born on March 23, 1957 in the village of Gannovka, Omsk region, Odessa region. In 1984 he graduated from the Art and Graphic Department of the Omsk State Pedagogical Institute. A.M. Gorky. In 1992 he graduated from Krasnoyarsk Art Institute, Department of Industrial Graphics. The first caricature was published in 2000. A participant in international and all-Russian exhibitions and cartoon contests. He is engaged in easel, book and magazine graphics, design and caricature. Laureate and diplomat of international, all-Russian, regional exhibitions and competitions in the field of graphics and design. Scholarship of the Ministry of Culture of the Russian Federation. Works are in the museums of Anapa, Omsk, Novosibirsk, Novokuznetsk, Tomsk, Surgut, private collections in Russia and abroad. Member of the Union of Artists of Russia and the Union of Designers of Russia. Professor of the Department of Design of the Faculty of Arts of the Omsk State Pedagogical Institute. A.M. Gorky.